1. See page 149 or substitute any other introduction given there. then step together and swing. Hand in hand they walk through the center of the set and between the third couple. The lady turns to the right and the gentleman to the left. b) The lady then stands between the second lady and the gentleman, and the man between the fourth lady and gentleman. 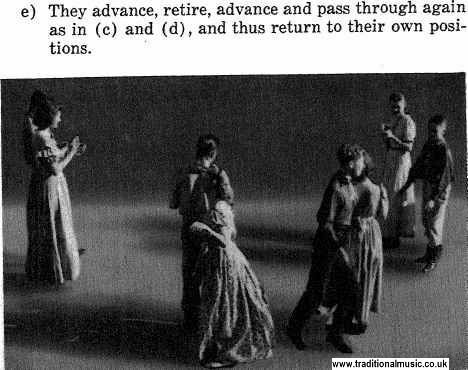 c) The three on each side, holding hands in a line, ad�vance four steps toward each other and then fall back four steps. d) They advance again four steps, and each gives the opposite person in the other line of three his right hand and passes beyond him. Each line thus reaches the other's position. The individuals turn around (rightabout-face) and take hands in the opposite direction. Down the center and divide the ring. The lady go right and the gent go left.